A Pit Bull Puppy Gets an Ice Cream! 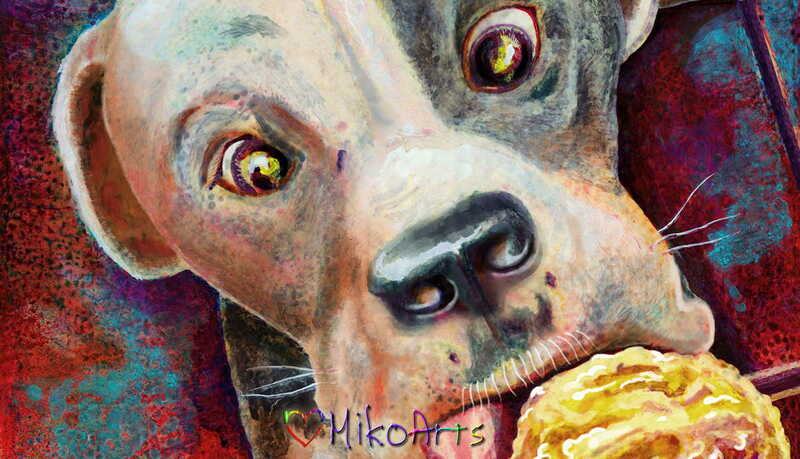 Miko Zen's Art, Odin Gets a Treat! Your 2019 Day of the Dead Calendar! Portrait of a little Pitbull Puppy whose owner rescued from a dumpster, literally, from being thrown away in an industrial trash can in a dark alley behind the university. A little pink and grey snout slurping his weekly cone... Dunkin Donuts gave him ice cream, but the fates gave him home. 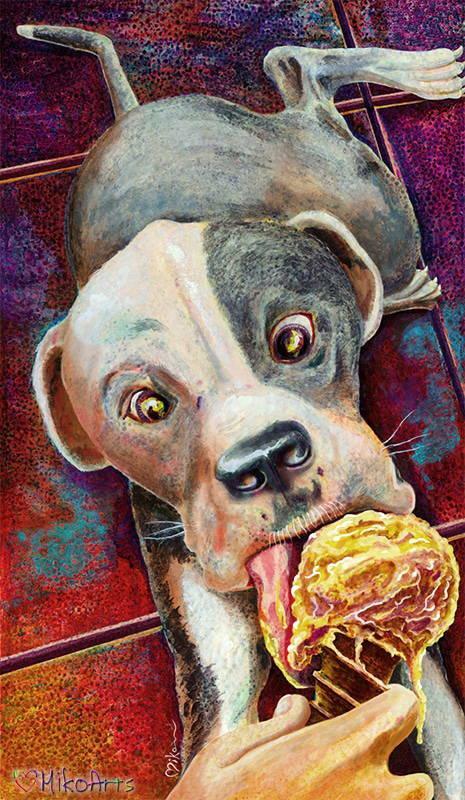 A Pastel Pitbull Painting.. Odin Gets a Treat! This little one made his owner's life so happy that they now regularly go to the neighborhood Dunkin Donuts and have an icecream together to celebrate their luck and happiness. I was working at the Dunkin Donut's near the university one night on a series of sketches, when at the table nearest me pulled up this adorable little pit bull puppy coming over to check me out, then quickly back to his awesome owner who had bought two ice cream cones, for their usual date night. This little guy's name is Odin, a ferociously adorable little grey and white and pink coated pup, who changed his owners life forever. His owner told me the story while they two were enjoying their strawberry lemon ice cream cones of how they both changed each other's lives. Most endearing was how easily it could have been missed if he had walked a different path, or left his house at a different time, and never came close to the dumpster that little Odin had been thrown in, abandoned and left for dead until he was rescued and given a new life.